To gain an understanding of reaction mechanisms, including the concepts of elementary steps and molecularity. To become familiar with reaction potential energy diagrams. To gain an understanding of rate-determining steps in multistep reactions. For us to truly understand a chemical reaction, including its rate, it would be ideal to see the exact bond-making and bond-breaking steps that occur at the molecular level – the reaction mechanism. Unfortunately, we cannot watch reactions occurring at the molecular level, but we can infer these events using kinetics and other chemical methods. There are only three main categories of molecularity because it is rare that more than three molecules participate simultaneously in an effective collision. This is a unimolecular step, and as the concentration of reactant A molecules increases, the number of effective collisions also increases. This reaction process proceeds in two elementary steps and would therefore be called a two-step mechanism. In the first step, bromide leaves from the starting material to give the cation C4H9+. In the second step, C4H9+ reacts with water to generate the product C4H8 and H3O+. The cation C4H9+ is called an intermediate, since it does not appear in the overall balanced equation and is generated in one elementary step but used up in a subsequent step. 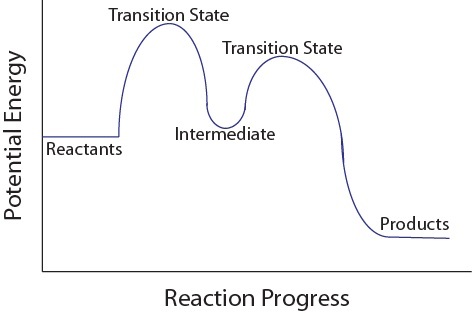 A potential energy diagram for this multistep reaction can be drawn as shown in Figure 17.12 “Multistep Reaction Potential Energy Diagram.” Notice each step has its own activation energy, and transition state (or activated complex), which is the highest-energy transitional point in the elementary step. Transition states are very unstable (high energy) as bonds are in the process of breaking or forming, and therefore transition states cannot be isolated. Intermediates are more stable than transition states and can sometimes be isolated and characterized by certain techniques. For multistep mechanisms, there is often one step that is significantly slower than the other steps. This slowest step is referred to as the rate-determining step, as it limits the rate of the entire reaction. An analogy that illustrates this concept is an hourglass having two different sized openings. 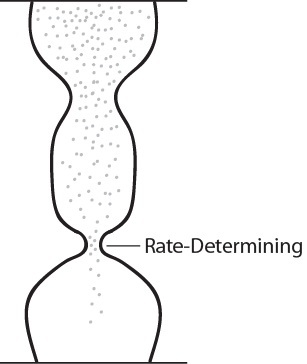 The rate of the sand falling to the bottom-most chamber is determined by the smaller of the two openings (Figure 17.13 “Rate-Determining Point in an Hourglass”). Similarly, the rate law of the overall reaction is determined from its rate-determining slowest step. 1. Determine the overall reaction equation. 2. Write the rate law for the overall reaction. The overall reaction process often corresponds to a series of more than one elementary step, which must always add up to give the overall balanced chemical equation. Each step has its own activation energy and transition state. The slowest step of a multistep reaction is the rate-determining step. Reaction Mechanisms by Jessie A. Key is licensed under a Creative Commons Attribution 4.0 International License, except where otherwise noted.